For someone who has never been snorkeling or diving over a tropical coral reef, it is almost impossible to imagine the sheer restless energy, the breathtaking colour and the beauty of a reef. Waves crash, currents drift, tides ebb and flow, drawing a ceaseless rain of food and fresh seawater across the reef. There are fantastically shaped corals from dome-like brain corals to mountainous pagodas, prickly tables and perfect spheres. Flitting and darting amongst the corals are numberless vividly coloured reef fish. Reefs which form close to land, following the contours of the coastline, are called fringing reefs. Where the reef is separated from land by a lagoon or open water, it is called a barrier reef. Coral reef atolls are almost exclusively a feature of the Pacific, where they form rings of coral up to several kilometers in diameter around open sea or sandy islands. The coral reefs of the Dutch Caribbean are very diverse. 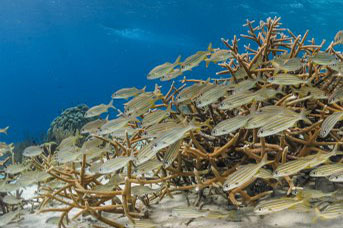 Bonaire and Curaçao have fringing coral reefs which encircle their islands. Starting in very shallow water, the reefs slope gently seaward to around 30 feet (10m) before dropping down to depths in excess of 200 feet (60m). St Maarten has patch/barrier reefs whilst the reefs on Saba are found on the top of underwater seamounts or pinnacles, which make for spectacular diving. St Eustatius by contrast has very well developed patch reefs. Despite enormous differences between coral reefs, they all have the same basic needs: warm, clear, sunlit water with an absence of sediment, which could choke and kill them, and a hard substrate on which to grow. They are only found in tropical seas where the year-round water temperature is between 18 – 30’C, or broadly speaking between 30’ north and 30’ south of the equator. Coral reefs are painstakingly constructed by a humble group of invertebrate animals belonging to the cnidarian family. Scleractinian (stoney) corals are closely related to anemones but different from them in that they form huge interlinked colonies consisting of hundreds and thousands of individual coral polyps. Coral polyps are incredibly delicate and very slow growing. The fastest species of branching coral only grows at 10cm a year; other corals take years to grow a few millimeters. Coral colonies can reach immense sizes and are tremendously long-lived. There are colonies alive today which are believed to be over 700 years old. Stoney corals have developed the remarkable ability to extract calcium carbonate from sea water. This they use to build complex limestone homes which form the solid framework, or matrix, of the reef. Around this framework there co-exists a complex web of life. Calcareous algae help to build the reef up whilst animals like boring sponges, worms, grazing fish and urchins work to erode it away. In their eagerness to graze on algal (plant) turf, parrotfish recycle huge amounts of reef: up to 75% of their stomach content is ground-up coral reef. Still other creatures find shelter on the reef and for them it is their home. This multitude of life is what we know of as the coral reef. But what has long fascinated scientists is how corals could build such immense cities of life in the aquatic equivalent of a desert. Oceanic water is remarkably low in food (plankton) and nutrients. Seawater is rich in dissolved calcium carbonate. Coral polyps are able to take this up and secrete it beneath themselves as microscopic crystals. The polyps of each type of coral build according to their own innate plan. And even though coral heads are incredibly plastic, forming radically different shaped colonies according to the amount of wave action, current and light, their polyps always build identical limestone homes. In part, coral reefs are valuable because they protect tropical shorelines from damage by storm waves. A recent World Bank study suggests that each square meter of coral reef in the Caribbean protects $ 47,000 in property. They provide hundreds of thousands of people with income and food from fishing. A coral reef in prime condition can produce over 20 tons of protein per square kilometer a year. And tourism is a major source of income for many tropical island nations. Caribbean reefs alone are worth around $ 140 billion per year in tourism dollars. At the global level, scientists believe that by taking up calcium carbonate from seawater, corals create carbon sinks which lessen the impact of the green house gasses involved in global warming. Coral reefs are home to such a vast array of animals and plants that only a small fraction of them have so far been described. More and more medical compounds are being isolated from coral reef creatures which can be used to combat HIV, cancer and other diseases whilst sterilized coral skeleton is already being used as a bone substitute for implants. But most of all, coral reefs give us an unparalleled opportunity to marvel at the wonder of life and the beauty and complexity of the world we live in.